Something needs to give. Vendors like VMware who predicate licensing based upon per-socket methodologies are going to be forced to take a hard look at licensing policies in 2019 as we exit the Golden Decade of per-socket licensing. Indeed, most vendors have already exited per-socket licensing, but those holdouts may not make it another generation. In this article, we are going to show why licenses must happen and suggest a few possible alternatives. In mainstream dual-socket servers, we have seen a 50% increase in core counts happen, but not often. In the technology industry, there is a positive trend toward more compute being used. So long as workload demands increase at a slightly greater rate, more servers get deployed and per-socket licensing is a stable mechanism. In 2019, this is set to change. Intel has mentioned Cooper Lake, however the nearer-term launch is the 2nd Gen Intel Xeon Scalable, codenamed “Cascade Lake.” While Cascade Lake, shown above, has a maximum of 28 cores in the mainstream parts, Cascade Lake-AP the company has said will have up to 48 cores per socket, and therefore 96 cores in a system. The plot thickens on the AMD EPYC side where “Naples” is 32 cores and the company has committed to a 64 core “Rome” generation in 2019. Based on what we know of AMD and Intel’s current cores, they are fairly comparable in per-core performance, and AMD can even notch wins core-for-core as seen in our EPYC 7371 review. Here is a way to visualize the 2019 spike that may trigger Licenseageddon in the per-socket license world. There is a lot to unpack here. 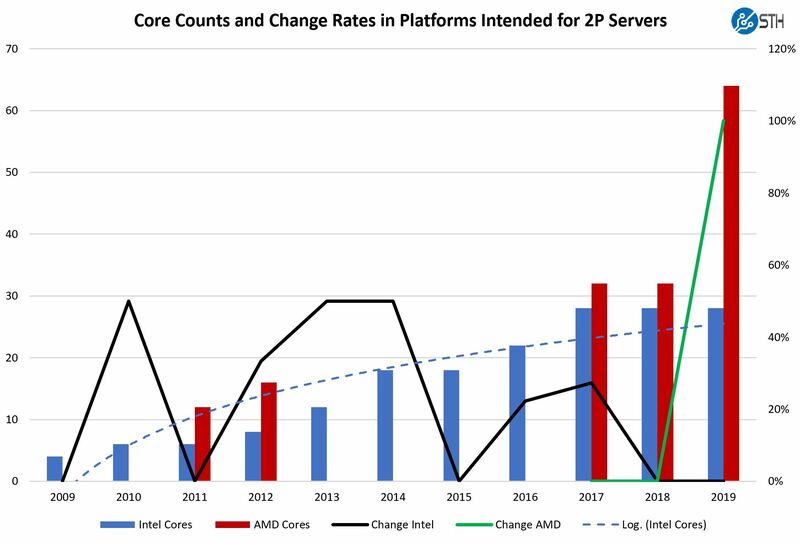 If customers of per-socket licensing software (VMware) found Intel Xeon Platinum 9200 codenamed “Cascade Lake-AP” attractive, they would have two vendors increasing core counts well beyond the historical trendlines for both nominal core counts as well as the rate of change of those core counts. 2019 values for Intel and AMD will spike well above the trendlines assuming Cascade Lake-AP pricing includes a premium that can make it still look attractive. 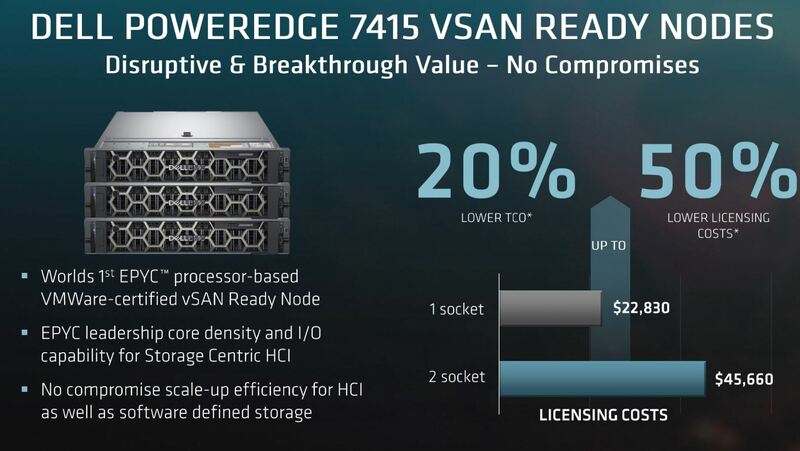 We have discussed AMD EPYC Extraordinarily Aggressive Single Socket Mainstream Pricing and the virtualization cost benefit in our Dell EMC PowerEdge R7415 Review. In 2019, “Rome” has the opportunity to be a fairly extreme outlier for those evaluating per-socket licensing. If VMware does not change, a chart like this is going to be compelling to buyers. AMD will provide 64 cores per socket while Intel will be at 28. 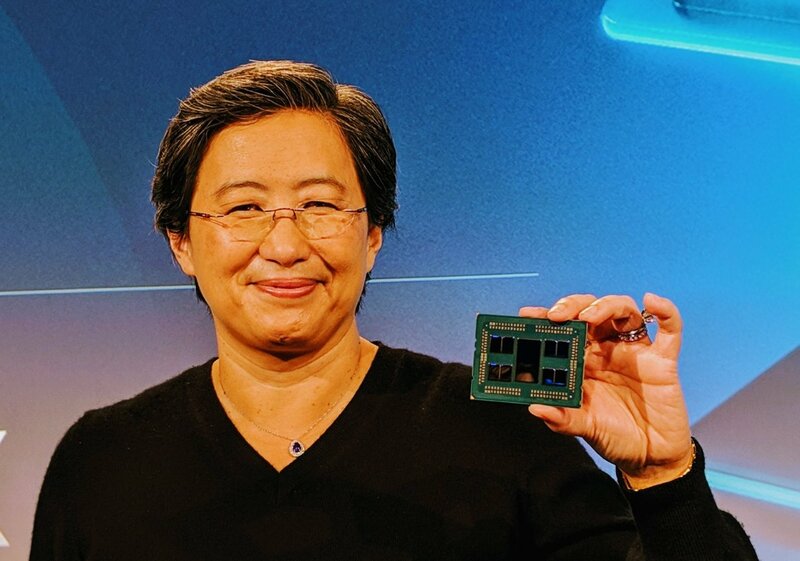 That could give AMD a 2.28:1 consolidation ratio over Intel in the 2019 generation. 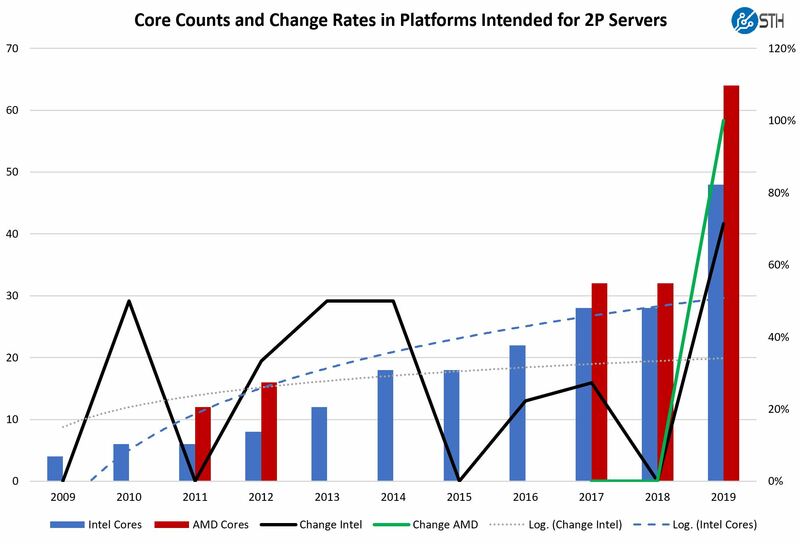 Further, an organization consolidating Haswell generation (Intel Xeon E5-2600 V3) servers to AMD EPYC Rome later in 2019 could realize a greater than 3.5:1 consolidation ratio over 4-year-old servers even using top bin 2014 SKUs. 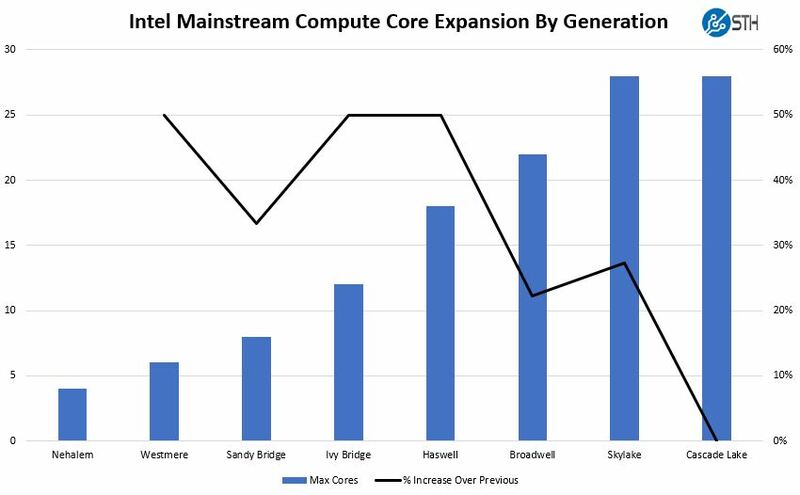 If you purchased in the lower-end of the stack at 12 core SKUs, you may see upward of a 5:1 consolidation ratio from older servers to 64 core AMD EPYC sockets. For VMware and other companies with per-socket licensing, a 1.5-4:1 consolidation ratio for Intel may be acceptable. AMD’s potential 3-6:1 consolidation ratio is not good for business. Ultimately, we see 2019 as a potential Armageddon for licenses or “Licenseageddon” due to potential outliers versus the Golden Decade core count trendlines. Most companies have moved to per-core licensing, with VMware as our example here still being largely per-socket. In 2018, Dell Technologies was happy to tout the benefit of AMD EPYC savings for VMware. In 2019, this will likely need to change if the story becomes 75% lower licensing costs. There are several options for per-socket licensing organizations. The most obvious is a move to per-core licenses. Many well-known solutions already utilize this method. It protects the software company against abnormally high consolidation ratios on refresh platforms as core counts increase. A more complex scheme is to utilize a performance baselined approach where CPUs or cores are given a performance-based license cost. This can help protect software company revenue at the cost of operational challenges. Going from a base unit of one socket to hundreds of CPUs can cause SKU proliferation and customer confusion. We expect something to give this year. For companies with per-socket licensing 2019 will be the biggest generational core count change in over a decade. This generational move will be the biggest spanning back to the single to dual-core and dual to quad-core transitions in the 2000’s. If Cascade Lake-AP is priced too high and not a valid alternative then per-socket licensing may be spared another cycle. Increased competition and the new core wars will eventually force per-socket licensing to change and that may happen sooner than many were expecting. Would like your thoughts on MS 2016 and 2019 per core licensing, which will see a dramatic increase given the number of cores that the new CPUs will enable. I was expecting MS to increase the number of cores for the base licenses to 24 from 16, with 2019. But that wasn’t come to pass, I wonder at what point the licensing costs will push companies to move to Linux distros with no license fees. I think CPU vendors will have offerings targeted at this. We are still talking a 3.5-4GHz band for most CPU cores these days which makes CPU licensing easy to calculate. Of course, if CPUs started getting to the point where people left licensed software, the software companies would need to monitor and adjust. VMware already reached market saturation for a number of their products which are per-socket. Disruption to this would shoot themselves in the foot when customers stop buy support and switch to a different hypervisor. If an organization switches away from vSphere for server virtualization, a hard look may also be taken on Horizon. Instead of per-core, they are running per-vm licensing for Horizon and have it for some editions of other products as well (vSphere Robo comes to mind). Essentially, EPYC 2 will need to offer an option with a modest core count (16-24) at higher clocks (2.7+) to be a viable replacement for our main VMware clusters. If AMD only offers SKUs with a thousand slow cores, it will be unlicensable for Windows shops regardless of what VMware does with their license model. Regarding AMD’s offerings, it wont be attractive for many VMware shops just because they would have to replace clusters entirely, as EVC and vMotion wont work across CPU vendors. And a lot of smaller companies just dont have the budget to replace all of their compute all at once. And if you dont have vMotion, why are you even paying for vSphere?